Some health advocates are worried that wi-fi and cellphone radiation poses a health hazard, but AARP is worried about a different type of wi-fi hazard -- the danger public wi-fi spots pose to privacy. A new AARP survey finds that nearly half of consumers use free public wi-fi at least once a month to conduct sensitive personal business including banking, shopping, and checking their email. 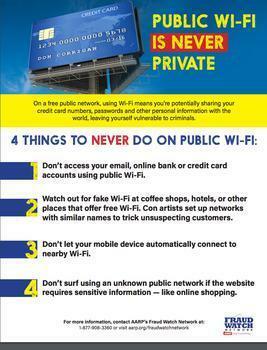 That's OK if the public wi-fi network is secure, but many aren't, said AARP's Frank Abagnale. To raise awareness of the issue, AARP is launching the Fraud Watch Network campaign. Besides conducting the study and issuing consumer bulletins, AARP says it will help coffee shops, retail stores, and other businesses that provide free Wi-Fi as a customer convenience by providing them with a small poster-type tip sheet that may be downloaded from the Watch Your Wi-Fi website. Abagnale, who was named AARP Fraud Watch Ambassador in 2015, has been associated with the FBI for more than four decades and has advised and consulted with hundreds of financial institutions, corporations, and government agencies around the world. Abagnale’s story was told in his best-selling book, Catch Me if You Can, and in the 2002 movie of the same name, starring Leonardo DiCaprio and Tom Hanks. The poster and other information is available online.